Postcard US-3139091 to the United Kingdom an advertising card for the Alternate Reality Comics, one of several Las Vegas comic bookstores that hosted the Free Comic Book Day events earlier today. Free Comic Book Day, first started in 2002 and taking place on the first Saturday of May, is an annual promotional effort by the North American comic book industry to help bring new readers into independent comic bookstores. In 2005, it coincided the movie release of Avengers: Age of Ultron this weekend. 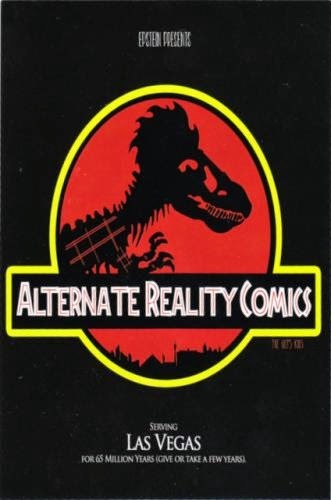 At the Alternate Reality Comics, greeters were dressed in costumes and helped to direct customers to free selections where a customer could get up to 4 free comic books. The store also hosted local artists who would draw for you.